For the discerning big wheel riders, Halo Freedom Disc Auralite Nb-A special alloy rims mated to the high specification sealed bearing Halo Spin Doctor hubs. Tough enough for all but the knarliest DH course, light and responsive enough for any singletrack. 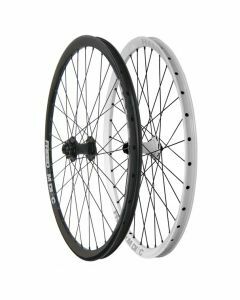 The Freedom Disc wheels feature silky smooth Halo Spin Doctor Pro sealed bearing alloy Disc compatible 32H hubs with Universal QR/20mm front axle compatibility. Front hub can also be used on 15mm T-axle (XTR) forks with optional adaptors. Rear hub can also be converted to solid M10 nutted axle or 12x135mm T-axle systems using additional Halo adaptor kits. Finished off with 32 plain gauge Black spokes. Halo 28mm Freedom Disc rims with eyelets. Universal QR/20mm Sealed Bearing Halo Spin Doctor front hub.